This five-acre site in the East End district of downtown was occupied by tenements prior to 1968, when the city cleared 60 acres for urban renewal. 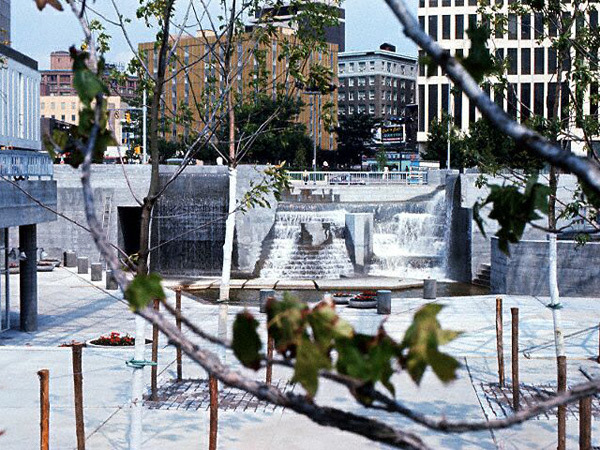 Designed by Lawrence Halprin in 1971-1972, this park was the centerpiece of the Southeast Loop Plan, an open space surrounded by largely unrealized high-density development. 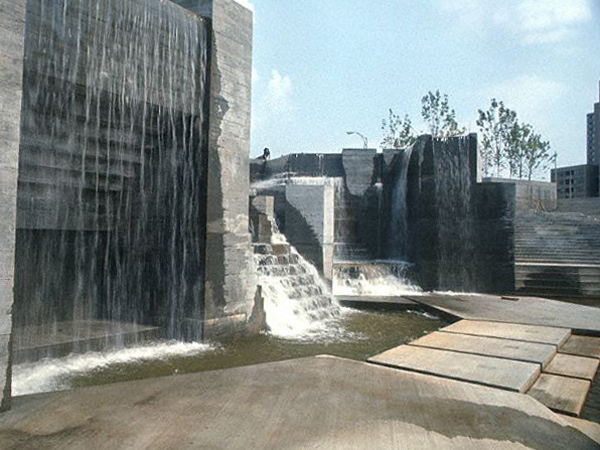 One of Halprin’s most multi-purpose facilities, the park opened in 1974, a reprieve from congested urban living. Vehicular and pedestrian traffic were separated via Park Drive (now Manhattan Square) and a sky-lit underpass below Chestnut Street. Halprin’s spatial organization alludes to the historic city street grid, 45 degrees off the current city layout. The park was divided into six zones, including a children’s play area with a wading pool, a hockey rink that converted to tennis and basketball courts, a large meadow for athletic events, a bermed garden shaded by a grove of trees, and a wide, tree-shaded promenade. 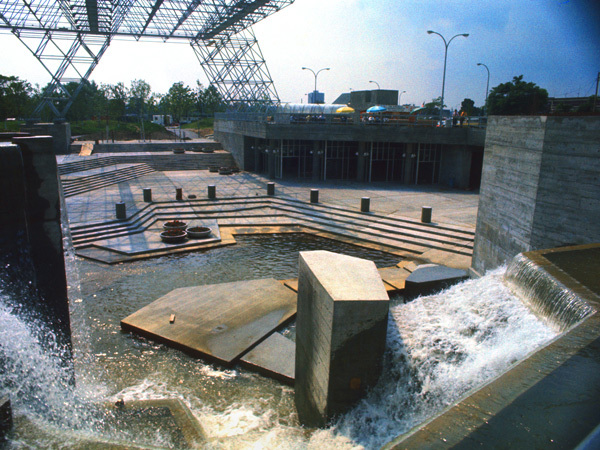 The focal point is a sunken, concrete plaza containing a 2,000-seat amphitheater with a restaurant, and a waterfall fountain. 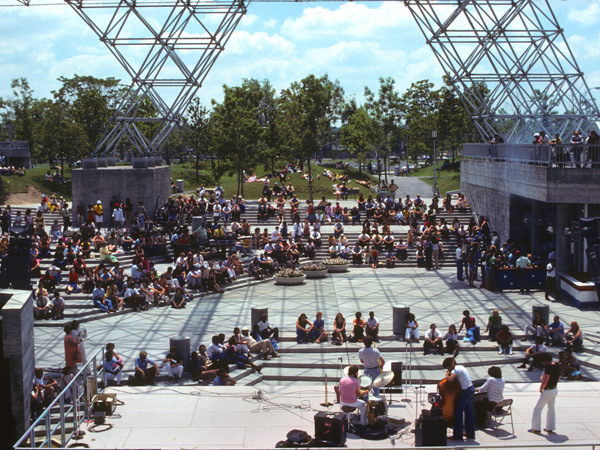 A steel scaffold-like frame with viewing platforms and an observation tower allows visitors to experience the plaza from a different perspective. The park’s complex, multi-level spaces were realized through concrete steps and retaining walls arranged in angular patterns. 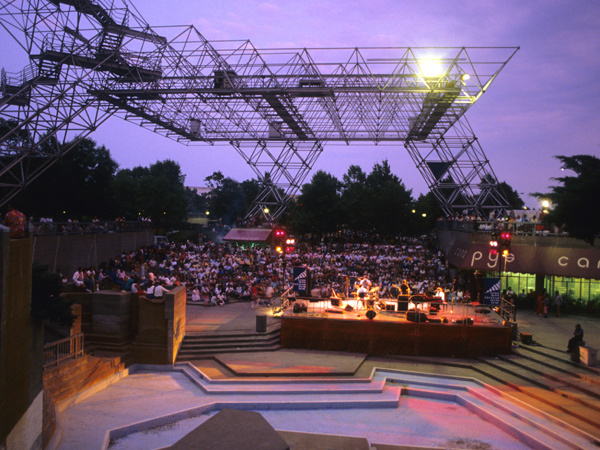 Today the amphitheater plaza with its steel frame, garden and promenade remain largely intact. 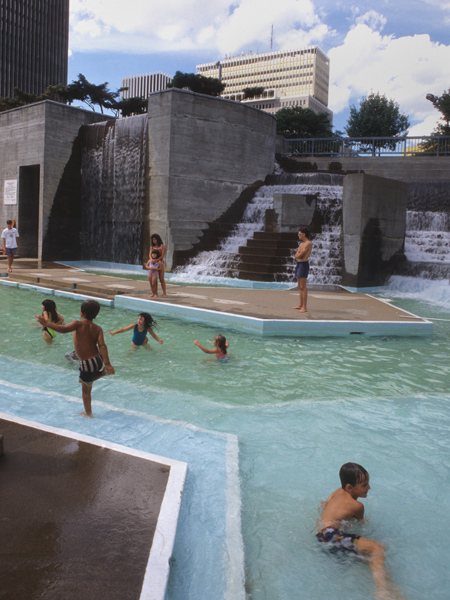 The children’s play area was updated in the 1990s and the skating rink was redesigned to double as a reflecting pool in 2008. The park was renamed Dr. Martin Luther King, Jr. Memorial Park in 2013.